Luke O'Brien, Stress Ball Stand. Adrian Leo and Xander Heckmon. 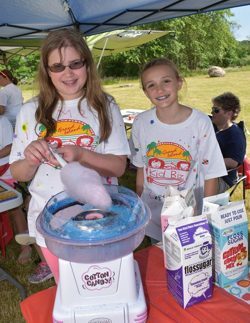 Maia and Georgiana Nowak selling cotton candy. Giannne Gerovese holding stress balls and Ella Zaremshi with slime. Mary Stewart photos and story. 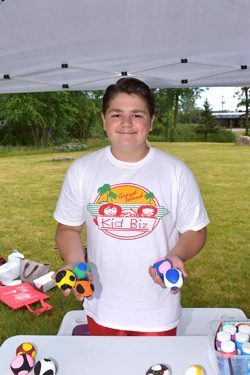 The annual Kid Biz, sponsored by the Grand Island Chamber of Commerce was held at the Town Commons on Saturday, June 21st. A lot of hard work and creativity by those participating, went into the preparation of selling their products. There was a wide variety of things to purchase from baked goods, jewlery, goodies and toys for cats and dogs, magnets, book marks, bath soap and much more.The weather was perfect and many people came out to support this annual event where the kids learn about selling at a class, then apply what they learned at Kid Biz. 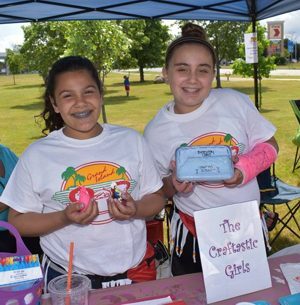 Allyson Nemeth and Jessica Flash started the Cooking for Cancer Club at the age of 10, when the two classmated decided at a sleepover to make a difference in the world. 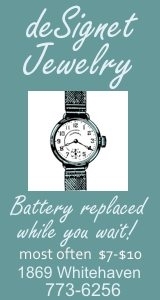 Since then, a simple concept has impacted many, fueled a long lasting friendship, and given hope to those in need. The girls set out to raise money for Carly's club of Roswell Park and pediatric cancer research by organizing bake sales. 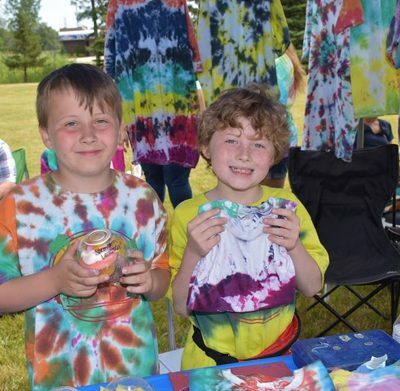 Their goal was simply to raise $1,000 in their first year. See the rest of the story. Girl Scouts of Grand Island strives to be an organization that builds girls with courage, confidence, and character to make the world a better place. The girls take great pride in their Grand Island community and the Buffalo Niagara region as well. Volunteering for the community is an integral part of their mission. This year many of the highest awards in Girl Scouting are being awarded to scouts on the Island including 3 Gold Awards and 6 Silver Awards. These awards are all based on Community Service. Projects include working with the town in dealing with the Emerald Ash Bore issue including initiatives for tree planting and Arbor Day activities, creating a Haunted Hay Ride station to benefit Miracle League of Grand Island, development of a 2 week summer reading and writing program for the Seneca Street Community Development Corporation, refurbishing the library at the Niagara Falls Boys and Girls Club, and cataloging and growing the DVD collection at Women's and Children's Hospital for the Child Life Program. The Service Unit also holds an annual Festival of Trees where trees are decorated and donated along with food/toiletry items to single mothers and their children. Individual troops also perform community service donating items to the Neighbor's Foundation, Buffalo City Mission, and servicemen and women here in Western New York and overseas. All of the girls learn responsibility, leadership, and confidence to help them become the best citizens possible with lives that are purposeful, giving back to their world. Seen a good looking dog prancing through a Grand Island neighborhood? Chances are it's been groomed at Dana's Stylin Pets. Since 2008, Dana Carver and her team have been busy grooming the dearly loved dogs of Grand Island, along with those who cross the bridges from other communities. Dana was just 10 years old when she started grooming. She worked for big box pet stores for many years before she realized her dream to be her own boss and run her own business. She says opening her own dog grooming business was a perfect fit. Because Dana was planning a move to Grand Island, she hoped it could also be the home of her business. Eight years later, pet owners are still grateful she made this choice. Dana says she owes much of her success to her dedicated workers, whom she would be lost without. Her daughter Catie, has been by her side from the very beginning, following in her mother's footsteps, also learning how to groom at the age of 10. Danielle Lazeration, with nearly a decade of grooming experience, has been with Dana's Stylin Pets for four years. Dana says Danielle is the peanut butter to her jelly. Becca DeLorenzo and Michelle Jagiello, groomers in training, round out her passionate staff. Dana is not only committed to her company and her clients, but is also committed to the community around her. Along with being an active member of St. Timothy Lutheran Church, she donates gift certificates and gift baskets to many causes, fundraises for Relay for Life and Diamond in the Ruff, and donates grooming to local rescue groups to help dogs find forever homes. Dana is also a volunteer Director with the Grand Island Chamber of Commerce, where she oversees the Youth Ambassador program and all of the fundraising efforts that accompany it. Dana's Stylin Pets is located at 1732 Grand Island Boulevard. The Grand Island Soccer Club has been part of the community since 1978. 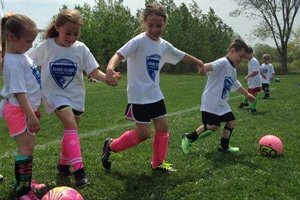 It has a long and storied history developing Youth players as young as 5 years old and helping to build the highly successful High School programs that are envied by many people around WNY. The club was built and continues to thrive on the backs of a passionate and dedicated volunteer Board in addition to over a hundred volunteer coaches, assistant coaches and other important support roles. These community members make a positive impact on the lives of over 900 kids each year. The club's mission states: "Our Focus Is The Development Of Each Player To Their Highest Potential In A Fun & Safe Environment." "It Is Through Soccer That The Club Strives To Reinforce Important Life Skills Such As Goal Setting, Teamwork & Sportsmanship." The current board members include Mike Rudney, Bethany Bernatovicz, Brian Dudek, Patty Shaw, Rob Walowitz, Roger Hutton, Adam Howell, Greg Robinson, Scott Boyko, Lou Fabiano, as well as Director of Coaching, Mike Ertel. Sue Marston is a lifelong resident of Grand Island and proud of it. Sue says because her childhood was all it could be and more, she is not only fortunate enough to but is also eager to give back to the community that has shaped who she is today. The Grand Island schools are on the receiving end of many of Sue's volunteer endeavors. When her son started Kindergarten, she joined the PTA as a council representative and by her second year, was elected PTA President. 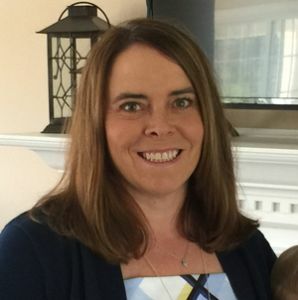 Along with her PTA responsibilities at Kaegebein, she also volunteered on the Playground Committee responsible for fundraising for the school's new playground built last year. In addition, she is a current Board of Education Trustee, an elected position, having served as Vice President during her first two years. As a trustee, she sits on several committees including the Community Education Committee, the Community Relations Committee, and the Internal Audit Committee. She also volunteers for a multitude of town organizations and causes including the Knights of Columbus, Lawn Mower Races, and the Grand Island Rod & Gun Club golf tournament, all while being an active parent for both the Grand Island Soccer Club and Grand Island Little League. Assistant soccer coach and team mom for her son's baseball team are two more hats she proudly sports. She is also a new Grand Island Little League Parents Auxiliary board member. To say she always goes the extra mile is an understatement. In fact, in 2015, Sue ran 1000 miles in memory of Kelly Knab, a Grand Island resident who courageously fought neuroendrocine cancer of the pancreas, and passed away at the age of 28. To honor her memory, Sue continues her efforts as a proud member of the Gingerstrong team that raises money for Cycle for Survival. 100% of all these proceeds are allocated to rare cancer research at Memorial Sloan Kettering Cancer Center. Her team, nationally over the last three years, has raised over $660,000. Sue and her husband Peter, are the proud parents to son, Peter Jr.
Cindy Wynne's career as an art educator actually began at a cub scout meeting. Although she was already enjoying a successful career as an award winning designer and art director, she realized that while her talent was to make art, it was her gift to work with young people. She went back to Buffalo State College where she had already earned her BS in graphic design, to earn her teaching certification and later her MS ed in Art Education. 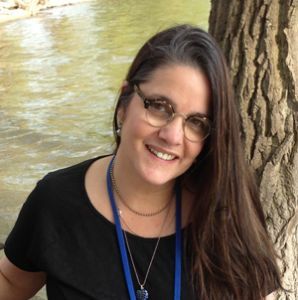 Her love for learning has recently led her to take post graduate classes online and at the University of Buffalo. See Cindy's full story here. Often referred to as the "Dynamic Duo" or the "Heart & Soul of Relay," Becky Stufkosky and Lynn Dingey have been working together as Relay for Life of Grand Island co-chairs since fall of 2011, along with behind the scenes partner, Candy Mye. Their first Relay as co-chairs happened to be the 10th Grand Island Relay, the event that pushed Grand Island over the million dollar mark in fundraising. Under their leadership, Grand Island was named a Top 20 Relay in all of New York & New Jersey in 2012 and has been the top fundraising Relay in Western New York for several years. Having met at a 2006 Relay planning meeting, each has their own "Why I Relay" story. But at the end of the day they're both working towards one thing, a cure in their lifetime. See Becky and Lynn's "Why I Relay" story here. The Citizen of the Year Award is presented annually to businesses and individuals whose contributions have made Grand Island a better place. The Grand Island Chamber of Commerce is proud to recognize those who so graciously give of their time and energy. These individuals are the foundation and spirit of our great community. Each of this year's recipients were nominated by fellow Grand Island citizens. All nominations were reviewed by the Citizen of the Year committee and chosen for each particular category. The Awards dinner will be held on Thursday, May 11, 2017 at Doubletree Niagara Falls starting at 6 pm. Tickets are $60 and can be purchased at the Grand Island Chamber office located at 1870 Whitehaven Road, Grand Island, NY. Each year the Grand Island Chamber of Commerce looks for businesses, organizations, teachers, individuals or someone who has gone the extra mile and has taken the extra step above and beyond their day to day responsibilities and jobs, in the Grand Island Community. 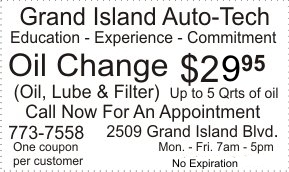 These are the people who have made Grand Island a better place to live, work and play. We all know someone who fits this bill and now is your chance to give them the thanks that they deserve! 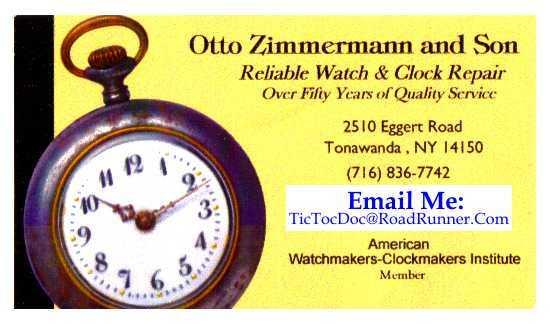 Nominations must be received by March 24, 2017. If you would like to recognize an individual or a business that have given greatly to the community, see the nomination form.